Book three of Codex of Alera brings in one of the biggest battles we’ve seen yet with the twist that Tavi is a man now and leading the Legion against the Canim. The Canim you say? Yes, our furry friends are the big bad invaders at this point, coming in midway through the book after Kalare has declared war on Gaius. Of course, the timing was rather impeccable since Kalarus had been corroborating with them. With our plucky friends torn in two different directions, Kalare’s war quickly takes a backseat to this insane Canim invasion. This book was a treat to read though, as it drops more surprise bombs and plot twists than the previous ones, all with panache. As the couples start solidifying through this book, most of the point of view switches centralize on them and it’s easy to follow. Couples Corner #1: Isana and Fade. Fade gets poisoned and Isana tries to save him. Easy enough, right? Well, these parts throughout the entirety of the book serve you on a gold flecked platter all the questions you’ve had before about Isana. Yes, she is Tavi’s mother. Yes, he is Septimus’ son. (Almost typed Optimus there and we’d have a Transformer.) Yes, her and Fade go way back. But Butcher uses her memories combined with healing Fade and discovering his memories to reveal the truth of everything that happened the fateful day that Septimus died. Fade’s selfless love for Isana, after knowing everything he’d gone through and sacrificed is both heartbreaking and beautiful, so his reward at the end of the book hits hard. Couples Corner #3: Tavi and Kitai. More Tavi than anything, this is his book where he really shines. 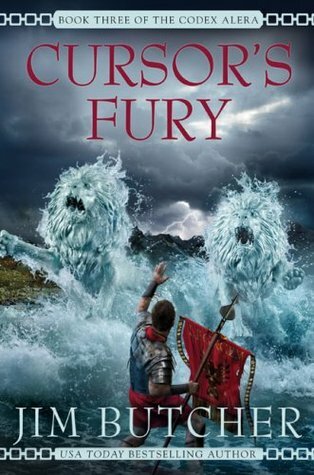 From Cursor to Captain after an ill fated explosion, he turns from the small child we see in the first book into a man in this one, taking command of an entire Legion against the biggest Canim threat Alera’s ever seen. Tavi really comes into his own as Septimus’ son and the heir, even impressing the First Spear, Fidelias in disguise. In pure Butcher fashion, there’s even a moment where the two hordes are on either side and Tavi takes some time to play ludus (chess) with Nausaug, the Canim Battlemaster. Absolutely fantastic. But on the Tavi and Kitai scale, their most important moment hits near the end, when they’re ready to get busy. First Tavi, then Kitai discover they’ve developed the ability to furycraft, effectively dropping the biggest storybomb yet. If you haven’t read them yet, add the series on your Goodreads!